Asus has packed a quad-core Rockchip RK3288 System-on-Chip (SoC) clocked at 1.8 GHz along with Mali-T764 GPU. As far as the field of computer engineering is concerned, AI is the only way forward today. Google has decided to help out the Maker community on this front by building a set of AI tools for the Raspberry Pi. 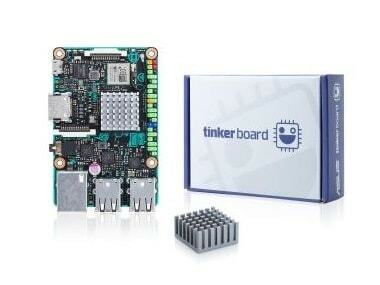 A surprising competitor to the Raspberry Pi has emerged in the form of the Asus Tinker Board. About the size of a Raspberry Pi, this device features some notable enhancements that set it apart from the Pi, and might even justify the higher price tag. Pixel or the Pi Improved Xwindows Environment, Lightweight, has arrived on PC. It’s a name that will be familiar with anyone who’s into Raspberry Pi. After launching the low cost, credit-card sized computer “Raspberry Pi3″ in February, its manufacturer element14 on Thursday unveiled two new upgraded cameras for the device. An Amazon employee has revealed instructions for making Amazon’s Echo speaker at a fraction of the cost using a Raspberry Pi. Raspberry Pi Foundation, the makers of, well, the Raspberry Pi, celebrate their fourth birthday today. To commemorate the occasion, they also announced the Raspberry Pi 3, to go on sale for $35 (around Rs 2,400). Raspberry Pi takes miniature computing to another level with the Zero priced at $5. Microsoft has just introduced Windows IoT Core Starter Key, a starter kit which will help developers to quickly start working on new projects.